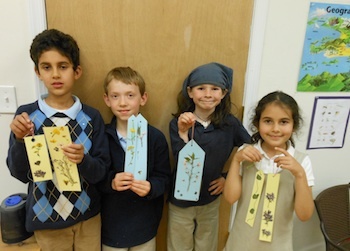 Students use flowers that they dried and pressed to make floral bookmarks. Elementary class hiked around the campus exploring this spring’s wildflowers. Dandelions and violets, Spring Beauty and Quaker Ladies, Redbud and Dogwood and Lilac make pretty bouquets. 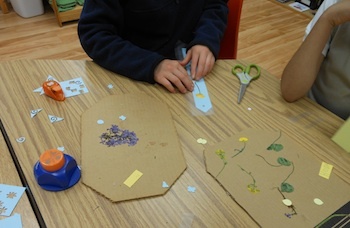 The physical exercise and fun led to refreshed study as they returned to school and dried their flowers in the flower press for a future Art project. Bringing the natural world into the classroom is an integral part of Montessori’s philosophy. The flower is studied in nature, and approached again through science, art, and language. The student studies the Parts of the Flower – flower, corolla, pistil, stamen, sepals, calyx, pedicel, receptacle using picture cards to guide them. Displaying their laminated floral bookmarks from spring flowers they collected. They often learn to identify the different varieties of wildflowers to be better acquainted with their environment. The language of flowers in poetry is introduced and drawing flowers from nature further connects their study. The students used their dried to make a variety of laminated floral bookmarks.